Please attend the Rainbow In My Heart competition this weekend, organised by my good friends at the Autism Society of Klang and the Rotary Community Corps. Visual art is a powerful tool to develop special needs people thoughts into a visible medium of communication with the community at large. Please support our local artists with special-needs! 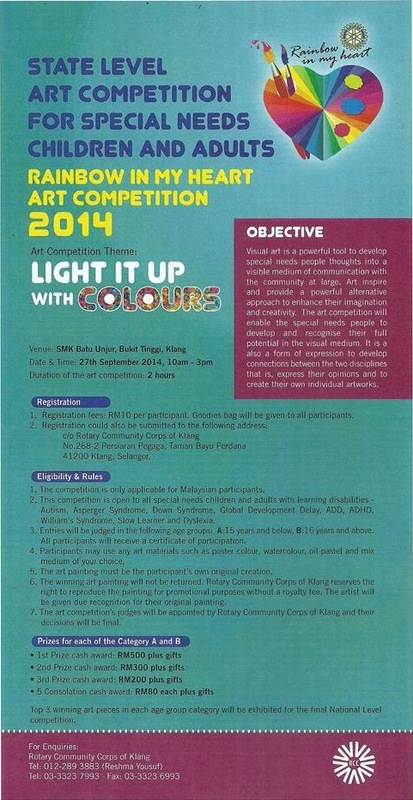 This entry was posted in Spectrum Mum In Malaysia and tagged art competition, autism, Klang by Admin. Bookmark the permalink.